I’m thankful for so many things this year: family, friends, health, prosperity, and so much more. I’m thankful for all of you who have read TQG or are waiting for PR to come out. I’m thankful that I get to do a job I love. I’m thankful that I have an awesome agent who always has my back. Really, I am very blessed, both personally and professionally. I’m also fortunate to have a dear best friend who invites us to spend Thanksgiving with her and her family every year. We spent the day cooking and drinking mimosas, which, let’s be honest, is a fabulous way to spend a day. It was a small group this year, just five of us. But because we do Thanksgiving right, we had three pies—pecan, pumpkin, and apple. I made my grandmother’s pecan pie and it turned out delicious if not beautiful (the story of my pie making). We also had enough food that everyone took home leftovers for Thanksgiving 2 tomorrow. The menu consisted of turkey, dressing, mashed potatoes and gravy, sweet potato casserole, bread, fruit salad, ambrosia salad, amaretto green beans, and cranberry salad. Pretty much the entirety of my favorite Thanksgiving foods were represented here. I did miss my mom’s baked beans, but I think I’m the only person in the group who likes beans. And we already had enough food to feed an army. Would you consider sharing that pecan pie recipe? We make pecan butter tarts here, but not pies. 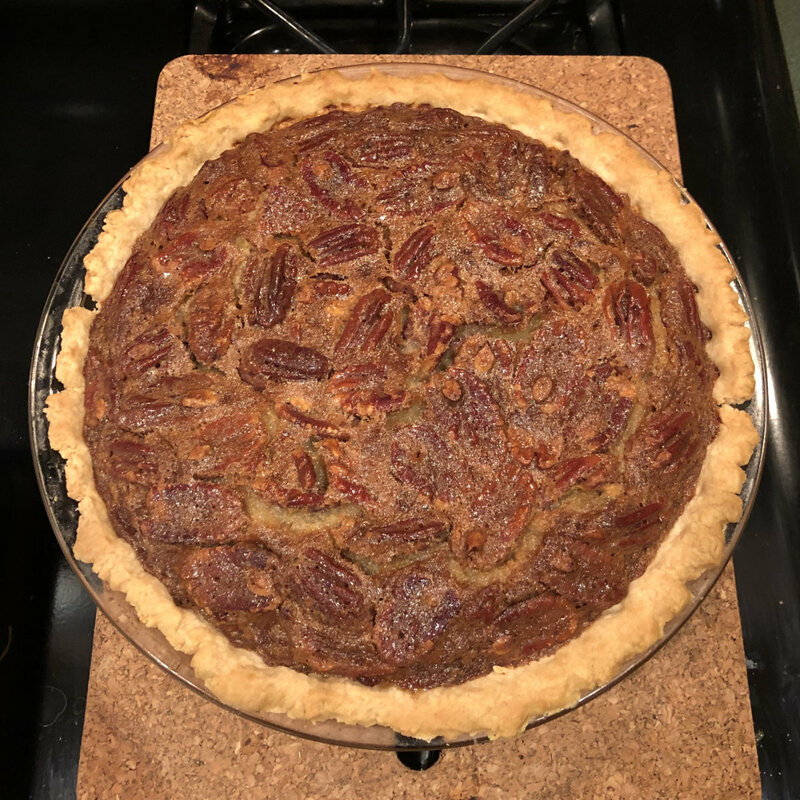 One of my daughters ate pecan pie when she was visiting in the USA, and has raved about it ever since, but I’ve never tried to make it. 1. Thoroughly combine eggs and sugar. 2. Stir in the salt, butter, corn syrup, and vanilla. 3. Gently stir in the pecans. 4. Pour mixture into 9” deep-dish pie crust. 5. Bake at 375° for 40 minutes. The pie will firm up a little as it cools, but you want it to be only a tiny bit wobbly when you pull it from the oven or it will be runny when you cut it. Sometimes it’s done right on time, sometimes it takes a bit longer. If it seems like the pecans are in danger of burning, turn the oven off but leave the pie in. I did this for ten minutes this time to get it to set. I’ll try this as soon as I get all these Christmas projects completed. It was just the 3 of us today, so we went out. No leftovers except for the piece of pics for later. My adult kid went onto other things with friends while I chilled at home. I already went to a gathering with friends this past Sunday. I too will be hiding out from the shoppers Friday. Happy Thanksgiving Jessie! Just the two of us this year. Smoked ham steaks, salad, and brownies. Just my little family of 3 so turkey breast instead of a whole turkey — still plenty for us!! 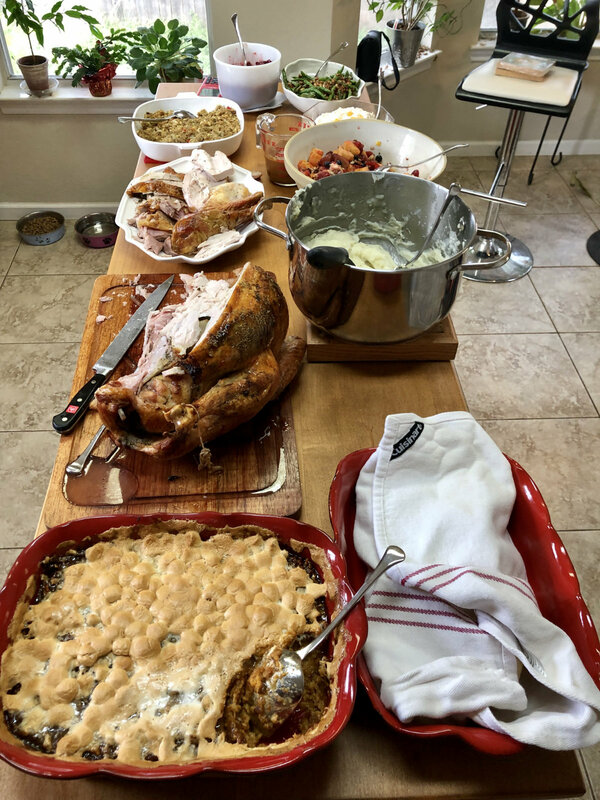 Traditional sides for the rest and a very yummy chocolate chip pecan pie that my very generous girlfriend baked for me. A very relaxed day spent with some of my favorite people. Previous PostPrevious Polaris Rising Snippet on Ilona Andrews’s Site! 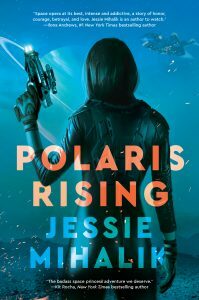 Next PostNext Polaris Rising Cover Quotes!